In 2016, we will celebrate our 13th wedding anniversary with our children at Disney World – our favorite place on earth. Max loves me more than seems justified, but he’s exactly the father my kids deserve, the kind of man I wish I’d been able to look up to as a child. Everyone he works, prays, plays or engages with loves and respects him. He’s one of those rare people who doesn’t seem to have any enemies. But there’s just one little thing. Max is a Muslim. beliefs. Oh, and they hate my 8-year-old daughter too. Facebook taught me that yesterday. In fact, Facebook has been educating me about the inherent disgust for my family for years now. However, after last Friday’s senseless tragedy in Paris, the rejection of my loved ones reached a fever pitch. It was a former aunt by marriage who posted a “fact” sheet (which I have not yet vetted) that delivered the blow that led to this post. The data in the meme purported to reflect Japanese restrictions on Muslims in their country. Said aunt (who has, it must be owned, recognised her prejudicial error, removed the post and apologised) added the editorial comment, “And so should the US,” in reference to Japan’s alleged closed door policy to Islamic people. It’s not like I haven’t experienced different forms of hate or racism by proxy over the course of my relationship with Max. Quite the contrary. I’ve had my luggage contents dumped on the floor for all to see in an airport in Omaha. You know, because I was traveling with a bearded brown man. A hateful employee at O’Hare, the world’s largest as well as one of the most diverse travel hubs, attempted to prevent my husband and I from flying on the same plane to our honeymoon destination. More recently, I was waved through a security checkpoint at the 9/11 Memorial in New York City even though my bracelets were tripping the metal detectors. However, my cousin by marriage, wearing a hijab, was harassed about a blue dolphin statue that I purchased for my daughter at the Museum of Natural History. My cousin had been kind enough to tote the item for me on her stroller, and her kindness turned into an ugly memory. Why obvious? Because it’s absurd to expect every American or Christian to denounce the distorted beliefs of a crazy person in order to stave off personal suspicion. As a culture, we do not afford the Muslim community that same courtesy. You know those people that spout racist speech but then take cover under dubious claims when caught? They’ll say “Oh, I have black friends” after making pointedly ignorant statements about the African-American culture. This phenomenon exists in discussions about the Islamic faith too. When I’m frustrated and emboldened enough to call someone out for their hate speech, and this has happened a few times, some are very quick to tell me they have Muslim friends who are “good people.” All better then, right? 1) No. I don’t believe you have Muslim friends. Because if you did, they would tell you that your gross, painful generalisations are unfounded. Max is a man of seemingly limitless tolerance and patience. But I’m not. Those security disasters I mentioned? My husband waits for them to end with humility. He does what he’s told and asks me to remain quiet so we can get through it and not draw extra attention to ourselves. He accepts that additional layers of mistrust and scrutiny are his lot in life – that he has to deal with being unnecessarily harassed for the good of the country. I sit there incensed and mortified. He just endures. I’ve learned to internalise my anger because if Max is willing to undergo racial profiling so we can board our plane to Disney World, who am I to presume greater entitlement to respect? Who am I to disrupt the peace he so desperately wants? But, instead of getting used to the repetition of these indignities, they fester inside. This is the world my daughters will inherit, the youngest of whom is being proudly raised in the Islamic faith. That’s what hurts and scares me the most. My husband is a big boy who can take care of himself. He was an adult with excellent coping skills before, during and after the horrible events of 9/11 that changed our country. But, my baby girl is sweet and innocent, thinks the best of everyone. I dread the day she realises that some will reject her based on one part of who she is. How will she react the first time she’s on the receiving end of a racist remark or hate speech about the only religion she knows? How will I react? I had a lot of disagreements with George W. Bush on policy, but I wasvery proud after 9/11 when he was adamant and clear about the factthat this is not a war on Islam. And the notion that some of those whohave taken on leadership in his party would ignore all of that, that’snot who we are. On this, they should follow his example. It was theright one. It was the right impulse. It’s our better impulse. We don’tdiscriminate against people because of their faith. We don’t kill people because they’re different than us. That’s what separates us from them. This blog was first published on Becky Sarwate’s blog and has been reproduced with permission. 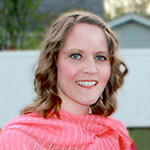 Jennifer Ashrafi is a broadcast professional and community advocate living in the suburbs of Chicago, Illinois. The proud wife of a Muslim-American and mother of two girls, Jennifer is passionate about social justice, equality and creating a safer, more understanding world. She can be reached at jennifer.ashrafi@yahoo.com.